While the ground outside Archvision is still thawing out, our team is inside getting ready for Spring. February’s plant additions collection includes (4) new hi-res plants. These shrubs include flowering shrub , a small green leafed shrub with yellow-pink pastel flowers, shrub  a hybrid evergreen shrub, shrub , a shiny green-leafed shrub and topiary deciduous , a well manicured topiary specimen. 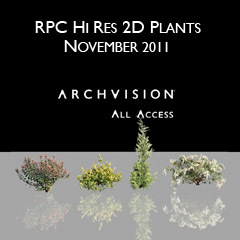 These ready-to-render plants are available for you to download now via the ArchVision Dashboard. Download the ArchVision Dashboard to try these now. The ArchVision team has entered the new year with great excitement about new tools and content headed your way. In the coming months, we will be giving you a sneak peak at some of projects we are working on. January also brings with it brand new hi-res trees. Check out the January hi-res trees additions deciduous tree , deciduous tree , deciduous tree  and small Japanese Maple  just added to the content exchange. 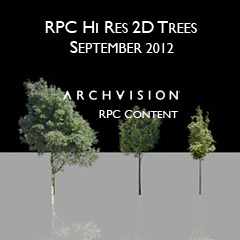 These beautiful hi-res trees are ready for download via the ArchVision Dashboard. 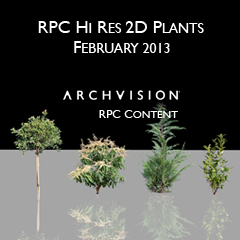 ArchVision is pleased to announce the addition of three new hi-res deciduous trees to the RPC Content Exchange. This collection of trees include a mature deciduous tree , deciduous tree , a perfect tree for a cityscape, and a variegated norway maple , a nicely formed young tree. Each of these are an excellent addition to any occasion where deciduous trees are required. ArchVision is pleased to announce the addition of four new hi-res plants to the All Access Exchange. This collection features the vertically growing Euonymous  plant, Euonymous  a small bush perfect for a hedge or garden, Euonymous  with long leafy stems and Outdoor Plant  featuring gradient green to purple tips to add some color to a landscape project. RPC All Access plan customers now have access to these four new hi-res RPCs and thousands more. 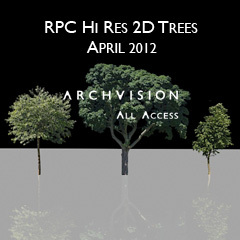 ArchVision proudly welcomes April 2012 Hi-Res Trees Additions to the All Access Exchange. This all new collection features the giant 30′ Deciduous [11} RPC tree, the great for any scene 14′ Deciduous  tree, and the subtle 7′ Deciduous  tree. ArchVision’s RPC trees come in all shapes and sizes. Amidst the hundreds of RPC trees you’re bound to find a tree that will complement your scene. These can be scaled to any desired height. 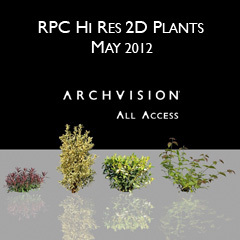 RPC All Access plan customers now have access to this new library of Rich Photorealistic Content (RPC) from ArchVision. Check out all of the latest RPC Content added to the RPC Content exchange by clicking recently added from ArchVision Dashboard. ArchVision Dashboard is available as a free download and provides users a free trial. You’ve probably noticed that more and more content is appearing in your Dashboard each month. As of March 2012 we’ve hit a milestone. This beautiful collection of plants titled March 2012 Plants Additions takes the official count of unique available RPCs to 4,000. This new collection of Hi-Res 2D outdoor plants includes Agave Variegata, Windmill Palm , and Yucca . 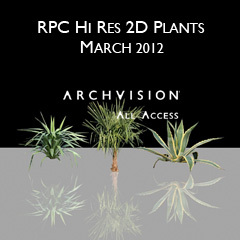 RPC All Access plan customers now have access to a new library of Rich Photorealistic Content (RPC) from ArchVision®. This RPC collection features Arborvitae, Euonymous , Shrub  and Flowering Shrub . Check out the latest RPC Content added to the RPC Content exchange by clicking recently added from ArchVision Dashboard. ArchVision Dashboard is available as a free download and provides users free trial use RPC Content.